And just like that there are now two Upper Deck releases for the 2017/18 season! As typical, O-Pee-Chee comes second out of the gate and brings its retro charms along with it. Boxes of OPC tend to have a huge variety of inserts and parallels to find when breaking them. I'm sure this box break will contain a huge stack of cards to go through and enjoy. 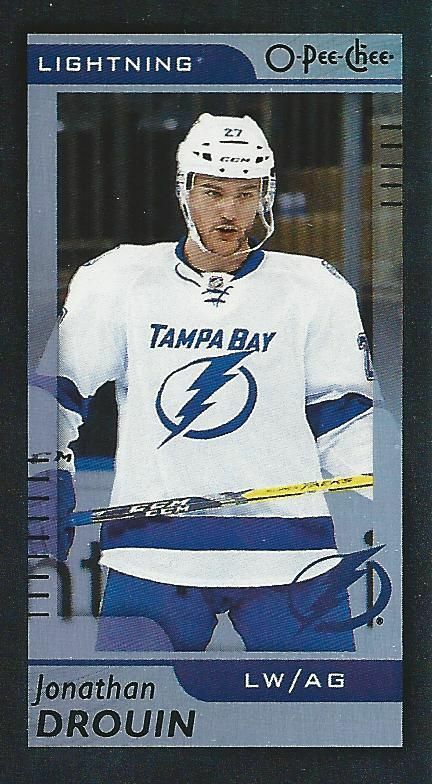 The O-Pee-Chee base cards this year have a more modern, clean look than in previous years. I like the use of white for the border colors. The lines used in the design scheme are clean and no nonsense. 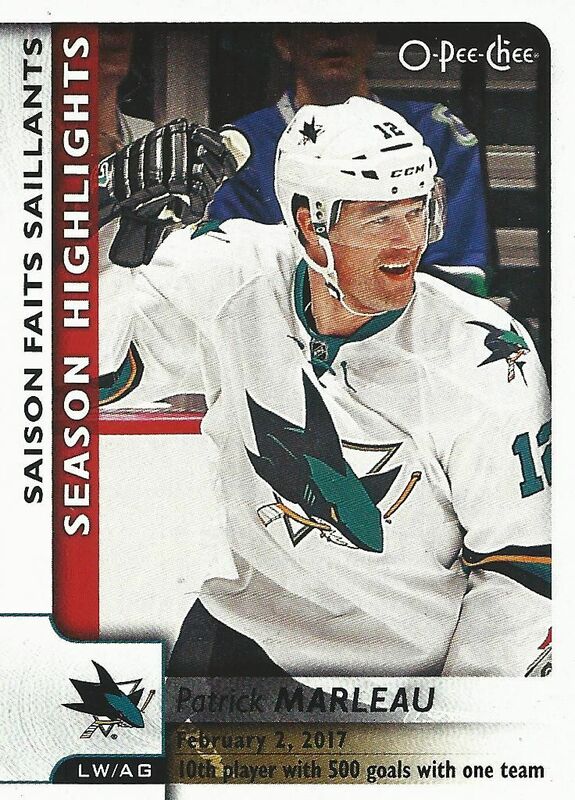 Upper Deck has come out with a very nice look for a modern OPC card this year. The photos also look a bit better this year as well. Flipping through my stack of cards, I enjoyed the action photography choices. This is a very solid outing for this classic card brand. Though the front of the card has a more modern spin, the backs continue the tradition of having the brown cardboard backs. 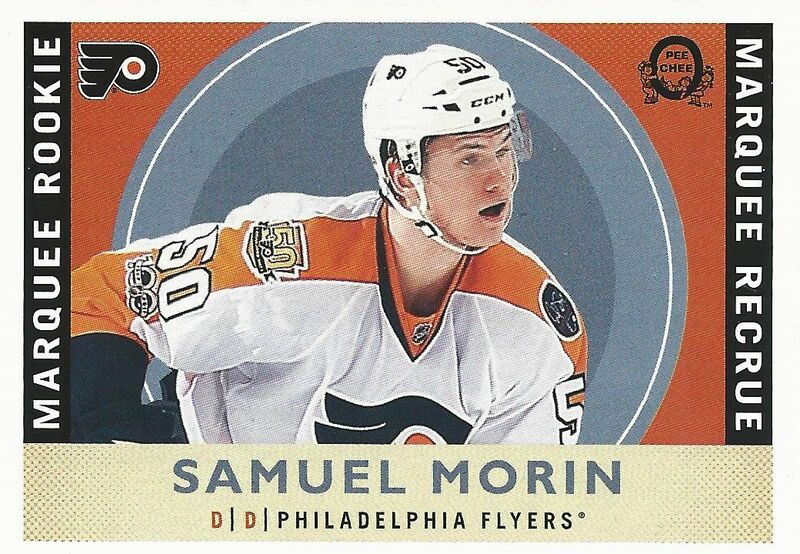 I, for one, never want to see OPC change the brown backs of the cards. These backs are a callback to the old days of card collecting. I do have to say that the font on the backs are very small. There is ample space left for stats - especially for younger NHLers. I would have liked to see a write-up or fun graphic used to fill in the big gap. This would be especially good since OPC features many players who don't show up in other cards set that have a smaller card count. Popular in these larger sets are subset cards. Old sets like Score would have Season Highlights and team cards. OPC is no different. The Season Highlight cards this year showcase special moments from the 16/17 NHL season. It's a nice way to remember the previous year. The write up on the back is both in English and in French - a nod to the way OPC has always done things. Team Checklist subset cards have a similar look to the Season Highlight cards. Another callback to years gone by, Team Checklist cards are mini checklists of all the players found on a certain team. These used to be useful to team collectors looking to complete just the team that they want. Team collecting is definitely still a thing, but these Team Checklist cards have really gone the way of the dinosaur. Rounding out the non-rookie subsets are the League Leader cards. These cards celebrate the best of statistical achievements from the previous year. These cards are a great way to include more cards of the best NHL players. 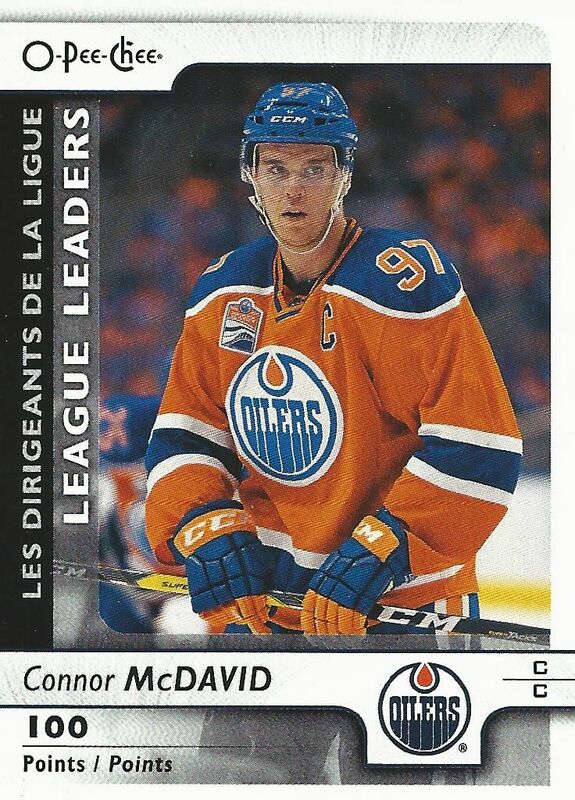 Getting another card of Connor McDavid in the set can't be a bad thing in Upper Deck's eyes. 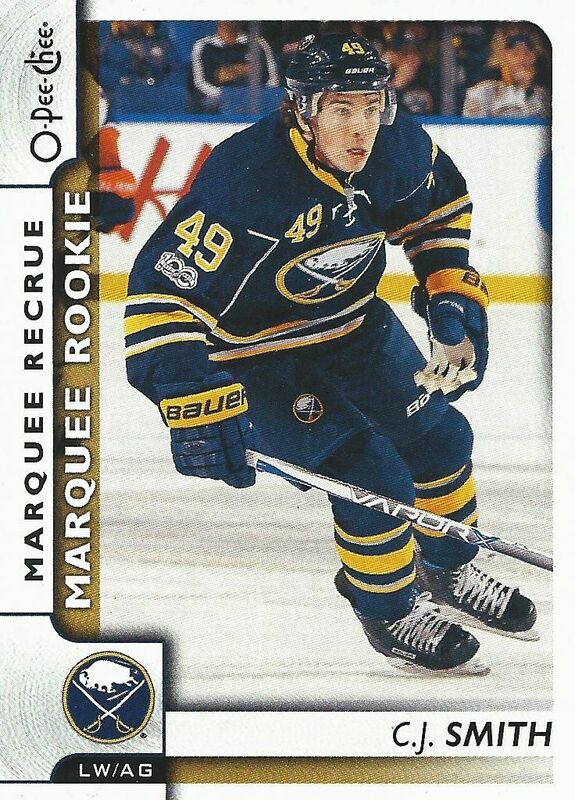 Marquee Rookies are back again as the OPC rookie cards. In design, they are very similar to the other subsets save for the golden yellow hue on the border. All the rookies found here are holdovers from the previous season. Upper Deck claims that this holdover class is very strong. Only time will tell if that is the case! 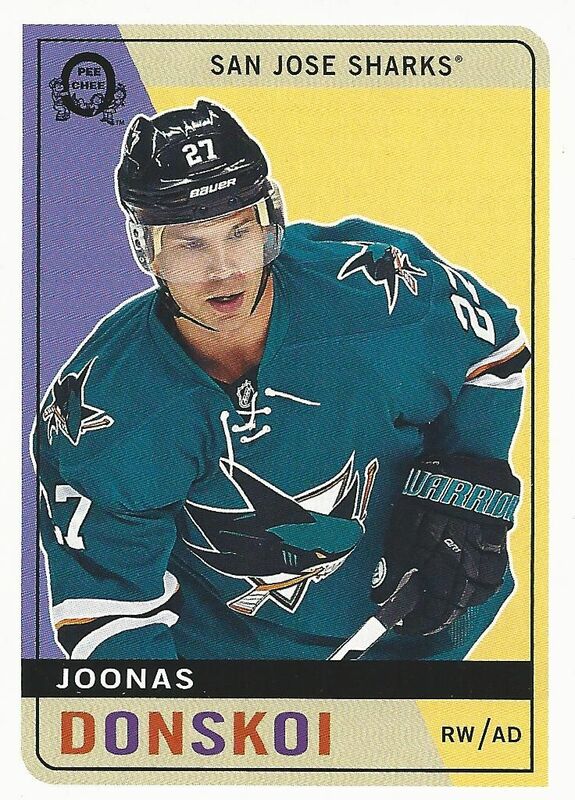 Usually we have to wait until Upper Deck Series Two before we can find the hottest OPC rookie cards inserts in that release. Boxes of O-Pee-Chee come relatively cheap. It's funny how the products that give you the most amount of cards are the least expensive. But that's the way it is! That being said, though you get a lot of cards and packs per box, the chance of getting of big value is pretty small. This set focuses more on the challenge of putting a large amount of cards together. Hit collectors should probably look elsewhere. 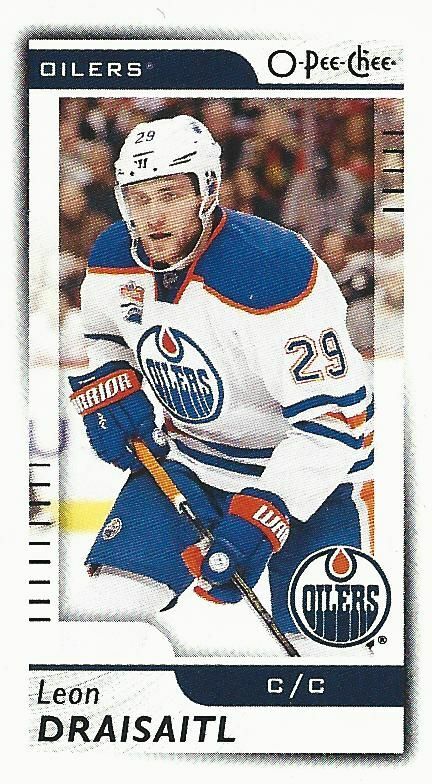 Mini cards have been inserted into O-Pee-Chee this year. These smaller versions of cards have been popular in other products, and they makes sense in a retro brand like OPC. The mini cards are not simply smaller version of the base cards as their design is unique. In the past, OPC had stickers, pop-up cards, and other mini card variations. Cards like these are what make OPC a fun buy. Of course the mini cards have to have their own parallel variations. There are quite a few different mini variants of the mini cards. The most common have to be the black rainbow foil cards. I pulled a gold bordered card, but other types have individual serial numbering and are very rare to find. Speaking of variations, the OPC Retros make their return again. As I mentioned in my video review, I am a bit disappointed with the design this year. I would say that the design is clearly retro-inspired, but the cards look generic to me. There isn't anything that is special or outstanding about them that would make me excited to pull one. 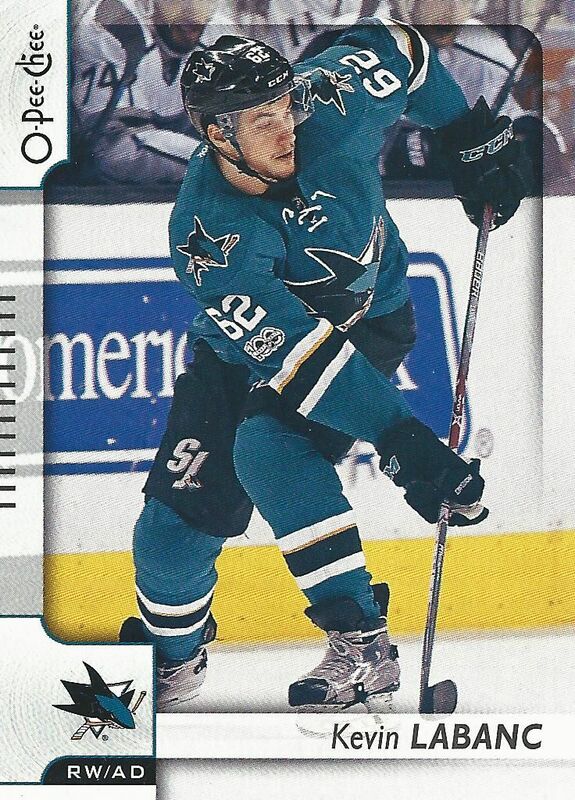 I think OPC needs to really think about making the retro cards something that excite collectors again. The Retro Rookie cards are at least a little better than their standard Retro counterparts. The Retro Rookie design is horizontal and has a look all its own. The team checklist cards also look nice. It's just too bad the designers dropped the ball with the base Retro cards. Want more parallel cards? Didn't get enough yet? Well, OPC has more for you! The rainbow and black rainbow foil cards have returned. These cards are good looking with a smoother surface finish than in previous years. I think these cards have stepped up in quality - they just look better! In my opinion, the OPC foil cards were some of the lowest quality foil cards you could find. One of the fun inserts from previous years has been the playing cards insert set. You can literally make a deck of playing cards from these. It's a unique idea that I find really awesome. I'd love a set of these! It would, however, be a very challenging set to put together. 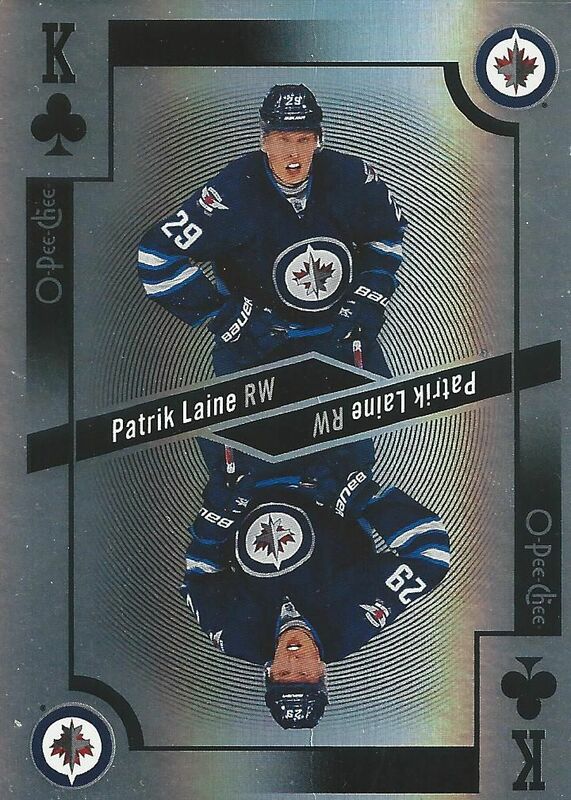 The Patrik Laine card I pulled is a foil variant. The standard cards do not come on foil. OPC is not without its bells and whistles. Getting a rare logo patch in OPC is rare and difficult. This year patch cards have returned and will be a huge challenge for fans to find. It would have been really awesome to pull one, but alas, it was not to be in this box! In terms of price, O-Pee-Chee is one of the most affordable card brands to buy. Unfortunately, this brand will not net you hits if that is what you are looking for. The challenge of OPC is to build sets and collect it the way you want to. There are plenty of collecting challenges to be had with this release. As a collector, I know that I am in it mostly for the hits, autographs in particular. If you're like me, you may want to steer clear of OPC and wait for a release later on in the season. But if you enjoy the purity of collecting sets and the challenge of putting a large amount of cards together, this is definitely for you. OPC this year offers up collectors a fun set of cards. For a certain collector, this set is great. I'm glad sets like OPC are still around. Its retro nature is definitely something different among the huge amount of modern era cards. If you're into it, I suggest diving right in as OPC will give you exactly what you want! Nice review. Would be cool to collect the set of playing cards. OPC is one of my favourite card sets! I'm really not diggin the set this year though.. Maybe it was just the box. But all the cards look good! I am disappointed there isn't any legends/older players base/inserts. I think I'll be buying more OPC this year, love the product! Base cards look great and it seems to be a pretty decent rookie crop. I love OPC stuff, it's sure I buy packs of these. saw the vid. i like it A LOT more than last year. I really like the look of the base cards, definitely one of my favorite looking base of all time, definitely a great break. I went out and bought a hobby box after work! Really enjoyed cracking it open. As a 50-year-old father of two, OPC brings me back to my childhood, especially with the retro cards. The size of the base set, along with the parallels, make it a challenge, and the price of the product makes it affordable enough that even youngsters can get in on the action. OPC is a great intro to the hobby for the young and the 'financially-challenged'! Too bad they didn't have some better inserts. The playing cards and mini's are kind of cool. Great base design, but I wish they had better inserts. Nice product though. The cards looked very good. It would be cool to put a plastic sheet on the playing cards so you could use them. Can't buy them on the upper deck web-sight yet. I've liked O-Pee-Chee in previous years, but I can't say the same about this one. Base design is too modern in my opinion, and wish they'd stick to a more retro look. I'm also not too big of a fan of the Marquee Rookie base design, as it is boring and easy to miss, as you've missed quite a few along the break. I do like how they have added the playing cards and minis again though. Oh OPC.. Biggest set of the year? That means a lot of base cards and inserts. 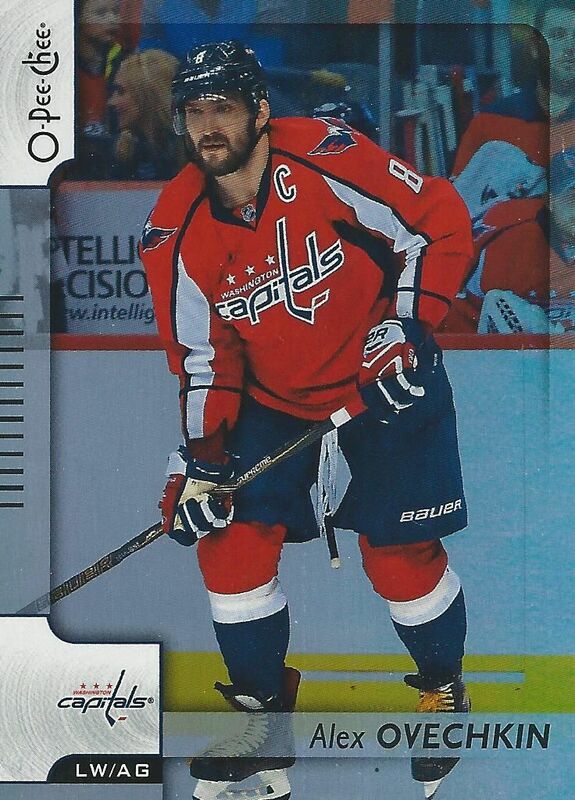 Not really a huge fan of OPC but I think the cards look really nice. Ahoy, the OPC design is clean & cool but the inserts/hits in hobby are disappointing. Thanks for recommending to avoid this! Fun Set with great variety. 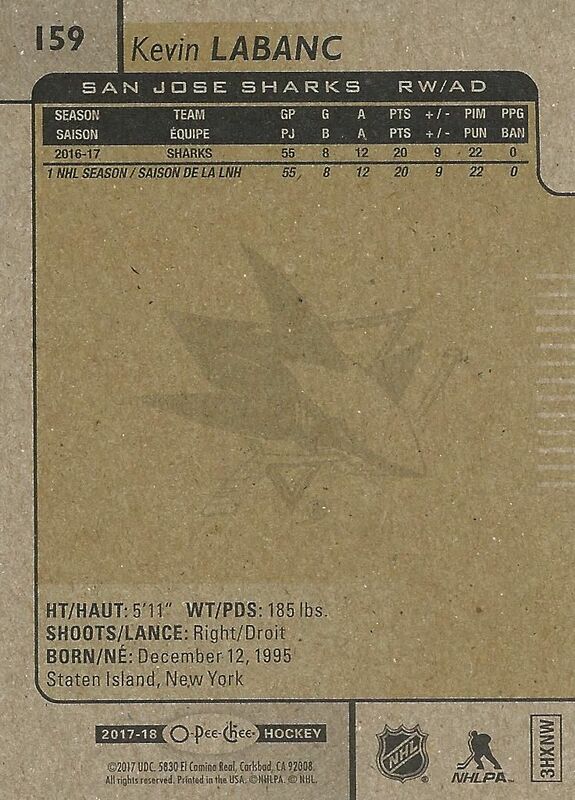 Sweet Laine Playing Card! I like the retros, but everything else feels to bland and to modern to be a good o pee chee product. I've never been a big fan of O-Pee-Chee and still I won't buy it by the looks of it this year. The product looks nice, too bad there are so few hits in it! The Laine looks really nice! Nice, fun, cheap break. Another quality review, Luke! Thanks for sharing. Would have been nice to get one of those manufactured patch cards but can't argue the composition of this break. Sweet "unannounced odds" Panarin gold border mini card and foil variation of the Laine King of Clubs. love how they made the base look modern with the carrdboard back looks like a nice set that i might have to buy som. I'm liking the more modern look of this year for sure!